Entity-relationship model is used to represent objects in the real world and the relationship among these objects, which represents the overall logical structure of a database. We have also seen that the data model that is independent of both the DBMS software and the hardware is the conceptual model. 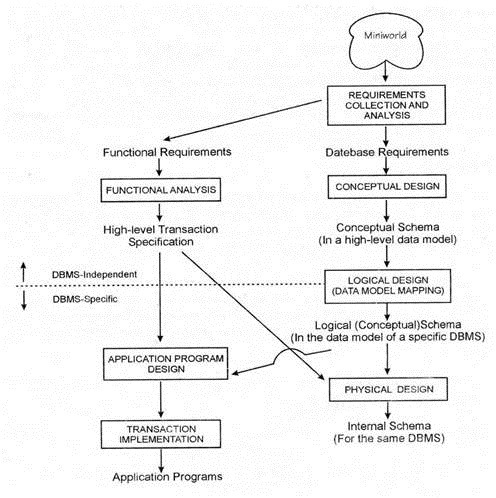 ER model is a high-level conceptual model developed by Chen in 1976 to facilitate database design. The ER model is extremely useful in mapping the meaning and interaction of real world enterprises onto a conceptual schema. The main usage is in the design of the database. Consider a relation called PART of degree 5. The five domains are sets of values representing, respectively, part numbers, part names, part weights, part colors, and locations in which parts are stores. The ‘part color’ domain, for example, is the set of all valid part colors. As the figure illustrates, it is convenient to represent a relation as a table. Each row of the table represents one n-tuple [or simply one tuple] of the relation. The number of tuples in a relation is called the cardinality of the relation; e.g., the cardinality of the PART relation is four. Relations of degree one are said to be unary; similarly relations of degree two are binary. The first step in database design is requirement collection and analysis. During this step database designers interview clients to get their requirements. Without getting the exact requirement from the client it would become very difficult to design a good ER diagram. It is useful to specify functional requirements of the application. Data flow diagrams are used to specify functional requirements. The next step in the application development is to create a conceptual schema for the database. The conceptual schema is one that describes the data type, relationship and constrains. This step is called conceptual database design. This concept does not include any implementation details as well as storage details. It is usually easier to understand and can also be used to communicate with non-technical users. After conceptual schema has been designed, the next step in database design is the actual implementation of the database, using a commercial DBMS like oracle, MS access etc. This step is called logical database design. Finally the last step is the physical database design phase. During this, the internal storage structure and file organization for the database are specified.